As multi-tasking professionals, many of us often have several active IM conversations going at the same time. It’s handy to be able to switch back and forth between them so we can get our work done easier. Because each conversation in Lync displays in its own full screen window, Lync also displays small tiles for each active conversation and call to help you switch between them. You can see these tiles from any screen in the app, including from the snapped view. Swipe in from the top or bottom, or right-click with a mouse. 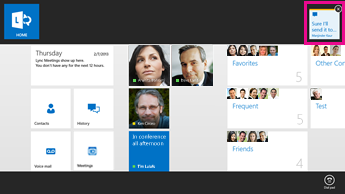 From the top bar, select a conversation tile to switch to its full-screen window. 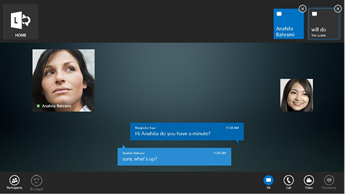 If you’re in a conversation window, the tile for the current conversation is displayed in blue, and the other tiles are in black. If Lync is hidden while you’re working on another app, a notification displays for a few seconds to notify you that an update has been made to one of your conversations. An update to a conversation can be a new message, or a participant adding video to an audio call. To see the update, open the Lync window. A highlight is displayed at the top of the screen to indicate the update. Swipe in from the top or bottom, or right-click with a mouse to see your active conversation tiles. The tile for the conversation that’s been updated is displayed in white with a yellow highlight bar.